Robe Tissage(JPN), 2010F. out of Petit Noire(JPN) by Singspiel(IRE), finished 6th (of 18) in the G2 Rose Stakes 1800m turf (yielding) on September 15, 2013. She had a nice prep for the G1 Shuka Sho! Satono Leopard(JPN), 2009G. out of Battle Empress(JPN) by Tony Bin(IRE), won in Nakayama 8R 1800m dirt allowance September 15, 2013. Thanks Tachyon! Glad Robe Tissage had a good prep and Satano Leopard is very handsome! So it is a shame if we have lost all of the previous information and wonderful pictures. Thank you for your comments, Colonel John and WarEmblemluvr. War Emblem is one of the great Kentucky Derby winners I saw in person. I was just trying to bring War Emblem's successes as a stallion together in one place in the hope that War Emblem fans could enjoy viewing them at any time they want. I had backed up most of the old files, fortunately. Also, War Emblem babies will continue to win. So we can rebuild this thread over time. Red Emblem(JPN), 2010C. out of Cascade Bouquet(JPN) by Special Week(JPN), broke his maiden in Nakayama 3R 1800m dirt on Sep 22nd. Testament (JPN), 2yo colt out of Black Emblem (by War Emblem; Shuka Sho G1 in 2008), won his debut at Tokyo, 2000m, on 12 October. 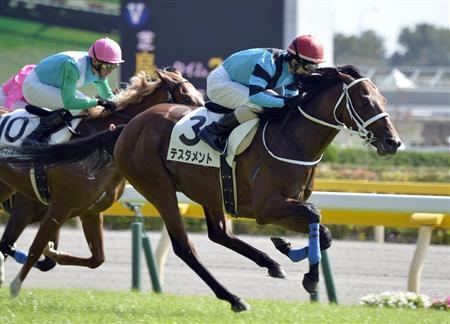 His weight was 430kg at the race, and the finishing time was the fastest for 2yos' 2000m debut at Tokyo. Narita Super One(JPN), 2009C. out of Marseille Cat(JPN) by French Deputy(USA), won in the Kyoto 10R Togetsukyo Stakes 1400m dirt allowance on Novermver 2nd. uma_nosuke wrote: Testament (JPN), 2yo colt out of Black Emblem (by War Emblem; Shuka Sho G1 in 2008), won his debut at Tokyo, 2000m, on 12 October. Testament is now likely to be pointed to the Begonia Sho 1600m turf at Tokyo on the Japan Cup day. I really look forward to his next outing!!!! TVG has been showing Japanese racing on Saturday nights, and not just a featured stakes race...we get almost the whole card. Unfortunately, we don't get Murray Johnson's calls until the later races. For Japan Cup night, I bet we'll get some TVG host(s) in the studio for the races...maybe we'll luck out and get the knowledgeable Rich Perloff. Testament didn't have a nice break. And 1600m was too short? I agree that 1600m is probably too short for Testament considering his last race. He still finished 4th. I didn't think Improvise ran a bad race either - probably one of the shorter distances he has run as well? How is Civil War doing? Is he running in the Japan Cup Dirt? WarEmblemluvr wrote: I agree that 1600m is probably too short for Testament considering his last race. He still finished 4th. Civil War has finished second in the Urawa Kinen (Jpn2) 2000m dirt at Urawa on Nov 20. He is not entered for the Japan Cup Dirt. Improvise(JPN), 2010 black colt. out of Cadenza(JPN) by Sunday Silence(USA), won in the Noel Sho Nakayama 11R 1600m turf allowance Dec 22nd. 12-3-1-2. Civil War(JPN), 2005H. out of Ticket to Dance(IRE) by Sadler's Wells(USA), won the Nagaya Grand Prix (Jpn2) 2500m dirt at Nagoya on Dec 25th. Tagano Emblem(JPN), 2010C. out of Catch the Gold(JPN) by Sunday Silence(USA), has won the Osakayama Tokubetsu Kyoto 10R 1800m turf allowance -- first 2014 winner for War Emblem! Tagano Emblem (#11 horse) comes flying from the last!!! I am just catching up with War Emblem since Christmas. Was busy over the holidays and then on a short vacation recently. So happy to see the postings! So glad to see Improvise back in the winner's circle and so so proud of Civil War as well! War Emblem offspring winning on turf and dirt and at distances of 1600m to 2500m showing speed and stamina and all different styles. Awesome the way Tagano Emblem was flying at the end from last and easily won. Civil War easily won as well and they were both on the far outside not taking the path of least distance. Glad to see Improvise placed closer up in the shorter distance. Yay! I sure hope Civil War will be a stallion - he is such a great horse. Love that white mark/blaze looking like his daddy's. Thanks for all the great news Tachyon! It's clear that War Emblem is a very good sire...his owners must be tearing their proverbial hair out trying to get him to impregnate more mares. 2012 Juvenile champion filly Robe Tissage(JPN) is entered for the G3 Kyoto Himba Stakes 1600m turf at Kyoto 11R on Jan 25th. She has to start from the widest barrier..
Too bad she had to start from post 16 in a short race. I saw she finished 7th. I will need to see the replay to see how she did. I also wonder if longer distances are better for her? I hope she/they find her niche and she returns to her winning form!